One of the top selling steam irons on the market is the Panasonic NI-E650TR U-Shape, thanks to its reasonable price and array of features. In my review, I’ll be taking a look at what exactly makes this steam iron so popular and how it fares with other similar priced irons. U-Shaped Soleplate – The unique curved back of the soleplate is designed to focus pressure at the center of the iron instead of at the tip so that there is less tugging and wrinkling during ironing. Retractable Cord – Something that you don’t see in many irons is a cord that retracts into the iron. This saves space and is much more convenient than wrapping the cord around the outside. Fast Heating Times – There are 3 heat settings, all of which are reaches within 1-2 minutes. There’s even a light to tell you when a particular heat setting has been reached. Excellent Price – One of the main reasons for the success of the NI-E650TR is its great value. 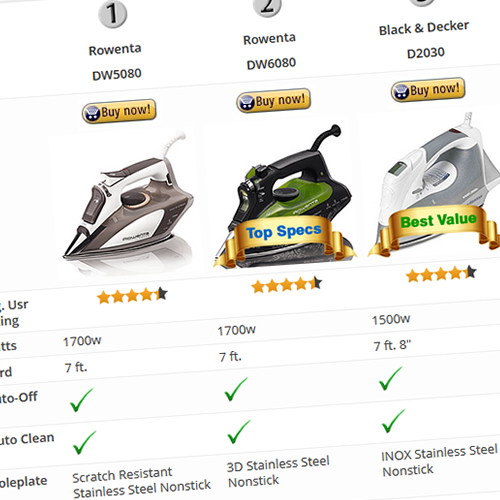 At just under $35, you’re getting a lot of features that is not the norm for an iron around this price. 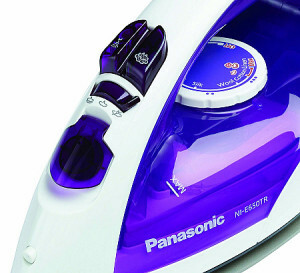 Dimensions 10.1" x 5.5" x 4.5"
Being one of the top selling irons on Amazon, the Panasonic NI-E650TR has been thoroughly tested by consumers. We’ve researched over 50 of their reviews to highlight the positives and negatives of their experiences with this product in order to help you make an informed decision on your purchase. Controls are large and easy to operate, and the water cap is conveniently located at the front. If you have arm or wrist problems, you’ll be glad to know that the Panasonic NI-E650TR is quite petite and relatively lightweight at only 3.3 lbs. Both of these qualities allow this iron to be maneuvered around easily. The entire middle part of the iron that houses the water tank, is described as a “violet” color, although it’s probably closer to a darkish pink. If you’re a man and you’re not worried about this affecting your masculinity, then this will not be a problem for you. Besides, this the color of the water tank allows you to easily see how much water is left inside. The handle is not too thin or thick, making it easy to hold, and the buttons are large and easy to read and operate. The water fill cover is also placed in a good location at the front, allowing you to fill it up without it leaking. At the back side of the iron is where the 8 ft. retractable and rotatable cord is conveniently located. It doesn’t get in the way when ironing and it has a fast and strong retraction. When placed upright, the base is sturdy and doesn’t get knocked over very easily. This is because the weight of the iron is fairly evenly distributed throughout. 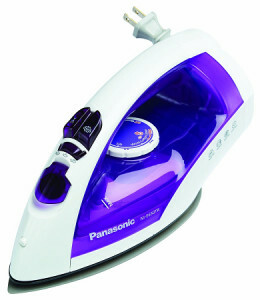 Perhaps the most unique feature about the Panasonic NI-E650TR is its U-Shape soleplate which is designed to help circulate steam underneath the soleplate and as a result, ironing is supposed to be a lot smoother. It’s also designed to concentrate pressure towards the center of the iron rather than at the tip so that there’s less tugging and wrinkling when you’re doing the ironing. Many users have said that ironing is indeed smooth and easy to move around, but it may be as a result of the Titanium non-stick soleplate and its compact and lightweight build, rather than the U-Shape feature. Some users have stated that they feel the shape of the soleplate makes no difference, despite having a positive ironing experience. It reaches the desired heat setting very quickly. 1-2 minutes depending on which of the three temperatures you’ve chosen. There is a temperature ready indicator light to notify you of when your desired heat setting has been reached. There are 3 steam settings (dry, low and high), with each one intended for a particular task. The Jet-of-Steam feature which lets off a strong burst of steam is powerful and effective. It’s also used for cleaning out the steam vents. Anti-Calc system ensures that sediment build-up is reduced so the steam vents won’t get all clogged up. No spitting or bubbling when the steam functions are used. There’s a 3-way auto-shutoff protection which turns the iron off automatically after a certain period of time depending on the iron’s positioning. There are only 29 steam vents in total and they only surround the top half of the soleplate. This means that steam doesn’t cover as much area when doing vertical steaming. Fortunately, there’s a U-shape indent on the lower half which allows steam to pass through when pressing. The NI-E650TR is only 1200 watts, so it doesn’t get as hot as irons with a higher wattage. 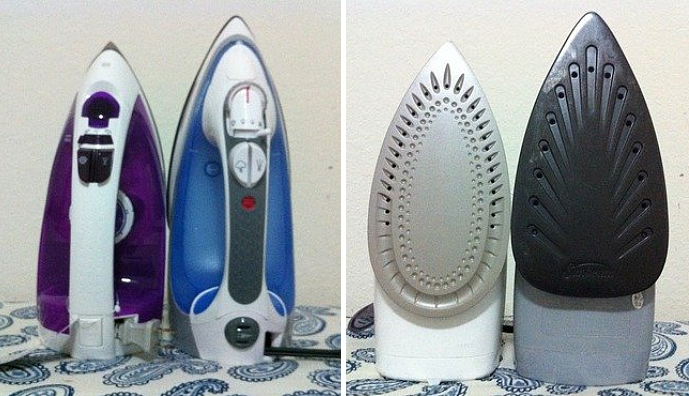 Some users experienced leaking when the iron is turned off just after an ironing session. There are only a handful of steam irons that are worth handing over premium money for, and if you’re not ready to shell out a lot of money or you simply don’t want to, you need to find a budget iron that is reliable and does a great job of ironing. The Panasonic NI-E650TR fits the bill perfectly. It has a great range of features and more importantly, it performs well when put to the test, which is why it’s such tremendous value for money. If you’re looking for something that’s a bit more powerful, then I highly recommend you to check out the Rowenta DW5080 or the Panasonic NI-W810CS. Click Here To See The Live Prices On The Panasonic NI-E650TR U-Shape Steam Iron Today! Myself and my team of researchers find out what the best steam irons are so that you don't have to. We base our research on how well each product compares with others and their performance based on real life user experiences.